The Maax Living 7242 drop in tub offers a contemporary design with a harmonious oval shape. 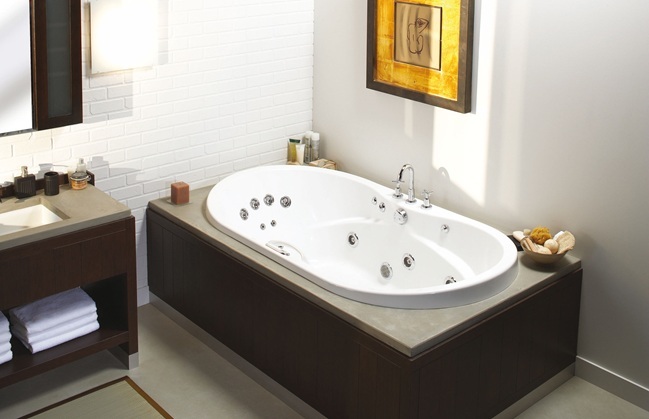 The Maax Living 7242 is an ergonomically perfected 2-person tub for absolute relaxation. The Living has an extra-spacious interior and plenty of leg room for unparalleled comfort. The versatility of the Living makes it one of our most popular tubs. Also available as an air tub, whirlpool tub or air/whirlpool combination. Call 800-720-1062 for more details. 42" x 72" x 23"
Dimensions 72" x 42" x 23.5"